Greek pita bread is much thicker than other pitas around the world. 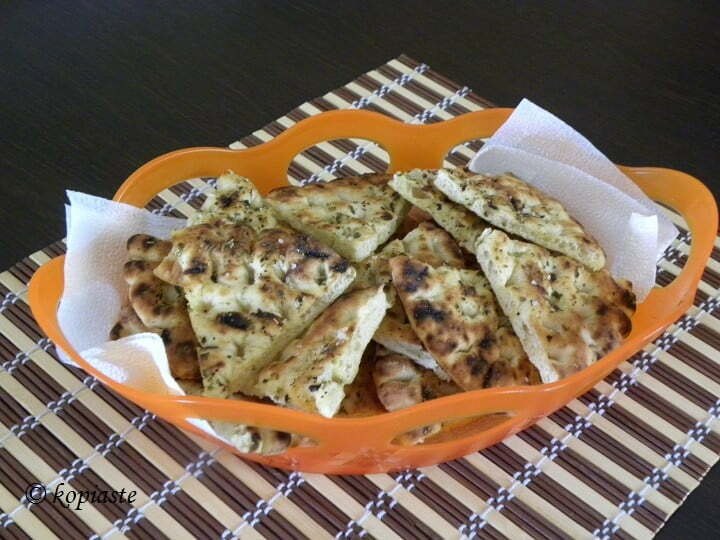 They are a good base to make easy pizzas or use them to make quick snacks. These baked Greek pita chips make a lovely accompaniment to any dip or spread or served with a topping instead of making bruschetta! However, before going to the recipe I want to apologize for the long time since I’ve last posted a recipe. Shortly after my last post, a malware was found on my site and Bluehost suspended both my sites until I had them cleaned from this malware. Bluehost were not helpful at all. They did not allow access to SSH nor did they tell us where to find the malware but suggested that we hired a company to clean the malware. The company they are co-operating with, Sitelock, asked for 200 Euros to clean the malware. Fortunately, my son has a good knowledge of computers but still it took him about a week to remove all the malware, as Bluehost kept finding more infected files! These Pita Chips are so delicious and easy to make that you will have them ready in less than fifteen minutes! They are perfect for dipping in dips and sauces such as Minty Avocado and Purslane Tzatziki, Hoummus with Butternut Squash, Tashi (Cypriot Tahini Dip), Taramosalata, Garlic Sauce with Basil, Scarlet (red pepper) Pesto etc. You can also use them in salads, like Dakos Salad but without using the rusk, or as a snack either on their own or with some cheese, salami, smoked turkey, etc. Pita chips with taramosalata and gavros marinatos. Pita chips with tomato, basil and graviera. (The tomato was cubed and basil finely cut and seasoned with salt, pepper and oregano). Pita chips with tomato, basil and salami. Pita chips with taramosalata and green olives. However, my all times favourite is a sweet one which is perfect as a snack any time of the day. I was surprised how well oregano complimented the taste of Loquat Jam with graviera. I’ve made similar chips many times, either using other kind of flatbread or other spices but these pita breads with oregano are my favourite and whenever a sea salt crystal bursts in your mouth it also releases a burst of delicate grourmet flavour to compliment all the other ingredients. Just give it a try and let me know! Preheat oven to 170° C (fan forced). Line a large baking tin with parchment paper. Coat one side of each pita bread with a generous amount of extra virgin olive oil. Sprinkle some coarse sea salt, pepper and oregano. Cut the pita in the middle and each piece into three triangles. Arrange the wedges in a single layer on the baking sheet and bake for 5 - 7 minutes. Turn the oven off and let them cool in the oven to become crispy. Serve with dips or spreads, or top each piece with your favourite topping. Siteground sounds like reliable and helpful company. Good that your site is now malware free. Those pita chips look so good, esp. for a carb lover like me. These tips are really nice. This post is very helpful for those who like delicious Food. I will try this Pita in my home. My MOM also made our traditional pita at my home regularly. This new recipe will bulk the stock of my pita collection. given a visual treat to my eyes . Looks Yummy. I would like to try this at my restaurant. very newly dish. i will try your suggested all Pita chips dish at home i appreciate this blog.